What are you looking at? 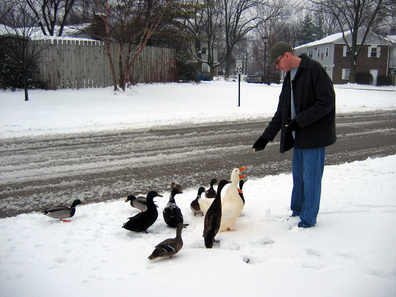 : Football and Churches and Ducks, Oh My! I love this post, and your last sentence had me laughing out loud. I think that it is fun when the hometown wins. Both of your hometowns, so to speak, won last night. As you know, I am definitely a fair weather fan, but I bought a Bears shirt and wore it proudly to school and church. I was prepared to buy a Colts shirt if the Bears lost and the Colts won. However, I plan to stick the Bears for the Superbowl although that Peyton Manning was amazing last night. The good Methodist pastor from Texas was promoting singing When the Saints Go Marching in on Sunday. I bet those Episcopalians knew the right team to cheer for in the heart of Indiana. KJ and Jack LOVE to feed the ducks. We usually bring a whole loaf to make the experience last a good amount of time. And the trick to keeping them at a safe distance? Bring a one year old who "KAAK"s at them like a ferocious beastly monster. They keep their space. Ever have one of those ducks bite you? Happened to me when I went WITH Molly and KJ a couple years ago to feed them. Not fun. What a good day: church, football, and WILD animals! It was somewhat parallel here in the I-65 above US-30 area. Bird food was place in a feeder for the first time of the year. It is good for birds to find food for themselves. But ground cover mkes it harder to find and so then we help. Football was so good the even the both of us watch nearly all of both games. And Sunday school class was pretty well attended. Um, I've always been a little afraid of birds, and this is EXACTLY WHY. Dear God. The Indianapolis/New England game was awesome from start to finish! We are going through the same thing with churches. It feels emotionaly wrenching, but you are absolutely right: there is only one God and He's not leaving. 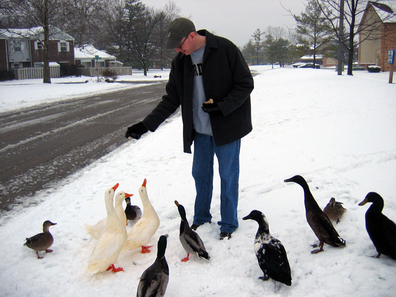 I just snorted at the thought of Jack "KAAK"-ing at the ducks. Hey, I saw that pic on Molly's blog of Jack growling at a cousing over a toy at Christmas. 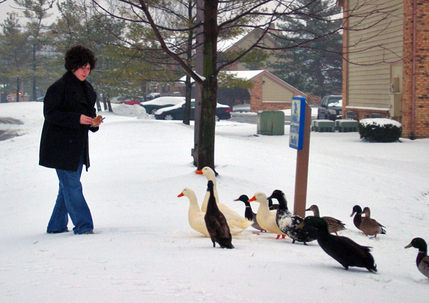 I would have freaked out with all those ducks around me too. They are, after all, wild animals. I'm so glad you had your camera with you to document it. Too, too cute! 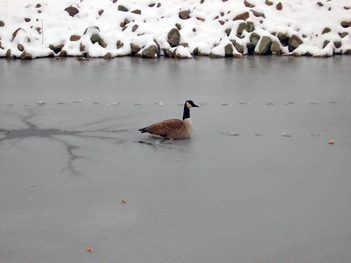 All I could think of when I saw that duck on the frozen pond was Idgie telling Ruth and Buddy Jr. about the lake froze with the ducks on it in "Fried Green Tomatoes". I wish you and Luke continued luck in finding a church. Last but not least: Go Colts! I must root for them. Peyton played for my college football team. I'm kind of emotional today. Oh. Dear. Lord. You brave woman. I would've been sobbing, had I been in your shoes (with the duck situation, not the football). I can't even go read the duck entry you linked to, so afeared am I of what I might read there. But thank you for trying to resuce the goose. I may not like the fowl, but I wish them no harm. Those are beautiful pictures. Simply beautiful. You can't tell that you were nervous, at all. Hooray for visiting a nice church. I hope you can find the peace you are so diligently looking for. And you're right, it's the same God and he loves you and is happy that you love Him. 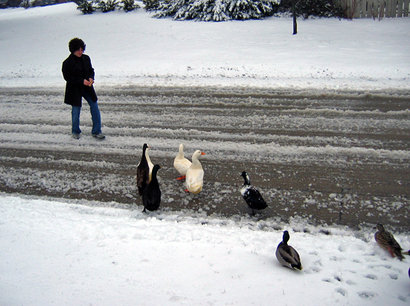 I love how when you go out in the street that white duck is totally checking for traffic. I love this post too! 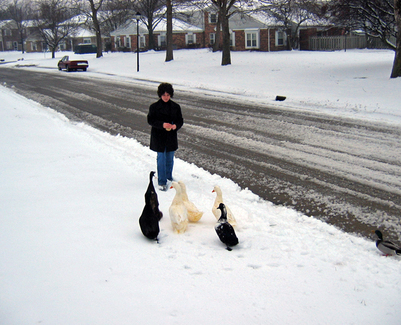 I love the pictures of you, Luke and the ducks--priceless. Edgar and I have gone to an Episcopal church together. It makes most sense for us. He was raised Catholic so he finds the services to be pretty similar. I was raised Episcopalian so..umm...well, I guess there isn't much compromise on my part...hmmmm At Edgar's nephew's Baptism last month we were at a Catholic church, but it was so very similar to my church back home so I knew the prayers and the songs, etc. Edgar was so confused as to how I knew everything and he didn't. I was like, um...I think it's all pretty standard. I was perplexed as to how he didn't know these songs! As we were leaving it hit him..."Oooh, I went to a Spanish Church. I don't know it in English." I'm glad you were ready to rescue the duck, even though he flew away on his own. Maybe he was just meditating? It's too bad I didn't get you getting freaked out by the approaching ducks on video. Maybe next time. You didn't mention that some of them would eat out of my hand, and not a single one of them bit me.